versolearning.com ■ Retail Price: Individual teacher/educator license: $60/year or $5/month. Verso offers special pricing for school and district purchasing. Verso 2.0 has been reimagined to deliver new and enhanced strategies, structures, and features in support of evidence-based high-impact teaching strategies. Quality and Effectiveness: Verso 2.0 supports teachers right in their schools by offering accessible, high-impact teaching strategies and evidence-backed feedback and data. The solution allows teachers to take advantage of cloud-based PD in their classrooms and gives them opportunities to collaborate with students and teachers and share their activities. Verso 2.0 is appropriate for grades 3–12, and the Professional Learning Network includes collaboration, study equity, teacher clarity, student and teacher questions, and feedback. Ease of Use: A simple dashboard anchors this all-in-one, easy-to-use program. Teachers can see and create activities, download and understand statistics, use the library for resources, and access My PD to share with others. They can also check their progress and that of their students. Teachers can create an activity, step by step, and access valuable “recipe” cards that inform their instruction. Verso 2.0 also includes both academic and contextual vocabulary for the activities. Because the platform is cloud based, it’s easy to retrieve and save materials, access feedback from students, and use real-time data. It’s also easy to add and delete students and to share with teachers from other schools or districts. The recipe cards give plenty of support for lessons. While teachers don’t have to use the software for every lesson, it’s straightforward to implement it when they want to expand and deepen the discussion to a higher level. Teacher/student or student/student collaboration using high-level skills is easy with Verso 2.0. Creative Use of Technology: This software upgrade has taken advantage of advances in technology to create a program that encourages collaboration and higher-level thinking skills. This innovative approach to PD has an easy-to-use dashboard for setting up classes, adding students, and creating activities that can also be shared with others. The solution includes customized directions and research-based resources (recipe cards with vocabulary). This new technology also enables teachers to collect data (e.g., response rate, comment rate, etc.) and use it immediately. Students can collaborate with both teachers and peers. 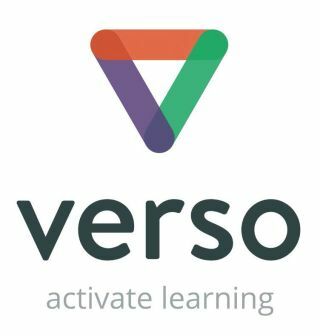 Suitability for Use in a School Environment: Verso 2.0 can be integrated easily into a school setting and can strengthen student collaboration and learning. It makes high-impact teaching strategies available for professional development and encourages teachers to use collaboration and questioning while helping students to interact. Verso is constantly adding new content and updating customers about what’s new so teachers can use new materials right away. With Verso 2.0, teachers can: upload files; target contextual and academic vocabulary; find and provide guided support; set start and finish dates; share activities within their school or more widely; create resources for libraries; collect data so that learning is visible and feedback is in real time; and place students and collaborate effectively with them. This excellent new premium version of Verso features refined and enhanced strategies and additional recipe cards. • Lots of resources are accessible from a simple-to-use dashboard. • Offers quality PD, on demand, that’s easy to share with colleagues. • Encourages the use of higher level thinking skills in collaboration between teachers and between students and teachers.